The story of a certain mass Hebrew enslavement in Egypt has no bearing in history and history books. The story of Hebrew exodus from Egypt, and how a certain character called Moses magically divided the red sea to create a passage, has no historical and archeological support for such event in history. Egyptian Empire was one of the most documented Empire and time in history, the evidences are all saved through paintings, drawings, sculptures, statues, mummies and papyrus. So I challenge anyone who believed the story of exodus to provide us with the name of that particular #Egyptian_Pharaoh who was drowned in the Red Sea with his armies while pursuing the fleeing Israelites. History has records of all the pharaohs that ruled and reigned during Egyptian Empire, but apparently nobody knows the name of that particular pharaoh? There’s no mention of it anywhere in all the records left behind? Ancient Africans Kemites (Greek translation Egypt) were not Arabs, they were not Asiatics either or any mystery race. They were tropically adapted #Black_Africans from south of the Nile river. 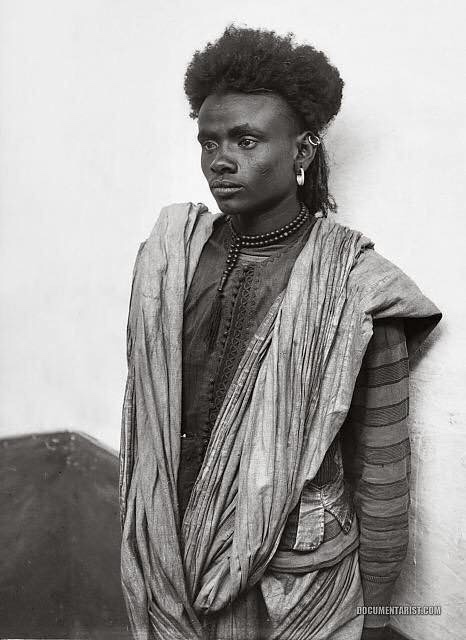 The picture in this post is a portrait of a Bisharin male, Egypt ca 1900. Arab invasion and occupation of Egypt was around 635AD. The legend that a baby was placed in a basket set adrift on the river to avoid being killed, rescued by a princess and raised as a Prince was first the story of Sargon of Akkad (2.334 BC – 2.279 BC). Sargon of Akkad claimed to be the son of the Anunnaki goddess Inanna or Ishtar the story predates Moses. If you think there was a man in history called Moses who became the leader of his people and popularly known as the law giver, who goes up the mountain ⛰ and receive laws from a God for his people.Then I will advise you to go research about #Manou_Of_India #Minos_Of_Crete and #Menes_Of_Egypt. Menes of Egypt are all legendary mythical stories of law givers. The Europeans gave you a book, bible that demonised Egypt and all her pharaohs as evil, they distracted you with fictional stories of Jerusalem and Israel, so while Africans are busy travelling to Jerusalem to go mumble and talk to themselves on a wall, come back and pompously add JP (Jerusalem pilgrim) to their names. Same Europeans are literally living in Egypt, digging up every nook and cranny of Egypt, same Europeans are busy digging up all the mummies of same evil pharaohs and Egyptians, researching and preserving them. While we are in Jerusalem to answer JP, the Europeans are becoming Egyptologists. While we are busy singing ‘Jerusalem Jerusalem Obodo maramma ugwu gbara ya gburugburu’ (Igbo Christian song) the Europeans have created a complete 4yrs university Bsc degree course called Egyptology, upon graduation they become Egyptologists. But some Africans when we return from our pilgrimage in Jerusalem we become JP. The Europeans are busy digging the cradle of civilisation, because they understand, that sometimes to understand the present and future you might need to go back in time. But most Africans are busy casting and binding every pharaoh in their lives, they are busy fasting, praying and shouting Jesus liberate us from every Egypt, because they have been successfully brainwashed and conditioned to see Egypt and pharaohs as representation of evil. Many of us didn’t even know that In 1974, the legendary pharaoh Ramesses II was issued a valid Egyptian passport so his 3,000-year-old mummy could be flown to Paris for necessary repair. While thousands of Africans are dying in midtrenean sea to get to Europe, millions more queuing up at embassies, the French government issued a visa to a 3000yr old dead body of a pharaoh, that’s how much they valued his dead mummified body. Keep casting and holy ghost firing pharaohs in your life, because you were taught they were evil, by same people who cherish their dead bodies (Pharaohs and Egyptian mummies) over you that’s alive. My people we were taught a lie and many more lies. Don’t just read the bible, start researching the bible and your journey for emancipation May just have begun. Previous Africa/Nigeria Education System Needs Urgent Redesigning and Revamping. Next Festus Keyamo Suffering from Stockholm syndrome.